Series enders are hard, particularly when the prior books set such a high bar. There are a lot of expectations, always so many questions that need be answered (especially after Prodigy's WTF ending!). Needless to say, I was nervous going into Champion. But I shouldn't have been. Champion was exactly the ending I was looking for - emotional, strong and wholly satisfying. 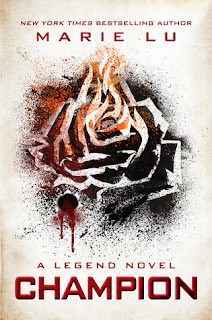 Legend is one of those series that gets better with each book you read. The world building is incredible, so real. It's not hard to imagine that Lu's dystopian future isn't so far off from our own. The iron-fisted Republic and the corporate control of the Colonies seems so fitting and uncomfortably familiar at the same time. The series is a trailblazer in the dystopian genre, taking such strong, likeable characters and throwing them in a despotic world full of political tension and all out war. It's an emotional rollercoaster from start to finish, that's for damn sure! They are perfectly imperfect. Just like their ending. Bittersweet, gut-wrenching but leaves you with a touch of hope. Let me just tell you right now, Champion's ending isn't sugar-coated. While it's not quite as brutal as Allegiant or Mockingjay (both of which I have MAD respect for ), it isn’t the happily-ever-after that most people expect. And this is something I really appreciate. We're given the best of both worlds. Champion's ending is left open to interpretation, so you, the reader, can take it wherever you choose while still having enough closure to feel satisfied. All in all, Legend is a series with heart, definitely something worth investing in. Champion was a perfect, albeit bittersweet, series ender to the Legend trilogy. Imaginative, honest and poignant, Lu has created a realistic dystopian universe with strong yet relatable characters, cinematic action and one hell of an emotional ending. Because I love this series so much, and as extra incentive for you to read it too, I'm offering up my hardcover copy of Legend. You can enter for your chance to win this Legend-ary giveaway at the bottom of this post. This series sounds great and I would love to read them one day. Do you know I still haven't read Mockingjay?? Shame on me! I've no idea how that series ended. WHAT?!?! Stop what you're doing right now and pick up Mockingjay STAT! So good! I LOVED the ending of Champion. I think if I described it to someone who hasn't read the series, they might roll their eyes at it. And I might even feel that way if it occurred in another series. But with THIS series and THESE characters, it was perfect. I loved the ending of Mockingjay, too. And I wasn't a huge fan of the Divergent series - the books were pretty average, IMO - but I had a lot of respect for that ending. I feel like Champion gave us the best of the best of both worlds --- it truly WAS perfect! I feel the same way you did about Divergent. The series was sort of 'meh' for me but I think Roth killed it with that ending. She kept true to the characters to the bitter end and wasn't afraid to kick it up a notch. "Perfectly imperfect" is a really good way to describe that ending. It wasn't what I expected at all, but I liked what happened in the end. Agreed on how it falls in the brutality scale as far as series go, too! I agree, Wendy! It broke your heart just enough to make it resonate but with just enough hope to keep you smiling. I ADORED it. Loved the ending, it was great :) I need to finish Allegiant, I have 100 pages left! So close, but yes I would agree, the ending is not the most happily ever after but it is perfect for the series! What were your thoughts on the Divergent series as compared to, say, The Hunger Games and Legend series? As much as I loved the concept of it, I didn't really enjoy it as much as THG or Legend. Mad respect for the way she chose to end it though.